Fresh from their 'victories' dealing with copyright, those rascals over at anon have carried on their righteous cause, moving on to target Paypal, Mastercard and Visa, amongst others, in retaliation for closing accounts used to accept donations for wikileaks. How's that going? In short, it's going as well as any other public toddler tantrum. Oh sure, there's a lot of noise and fury, maybe something gets a little damaged during the tantrum, the parent looks bad, the kid still doesn't get what he wants (maybe gets punished) and life goes on. Operation Avenge Assange, for those that don't know, is a continuation of Operation:Payback, the HIGHLY successful series of Distributed Denial of Service (DDoS) attacks on copyright targets. The targets so far have included Paypal, Amazon, Visa and Mastercard. The rallying cry behind these attacks is simple. “Free speech,” they cry to one another, “don't let them silence things”. What, perhaps, is forgotten, is that these companies have (rightly or wrongly, corporate citizenship is not the issue here) the same rights to free speech. They can say what they want too. And the First Amendment? That prevents the Government from making any laws to restrict free speech (within reason), but these are private companies, NOT the Government. Additionally, these companies have the right of free business, meaning if they no longer want to do business with you, they don't have to (which is a form of free speech of its own). These companies have decided (for whatever reasons, rightly or wrongly – I'm not debating their reasons, just their actions) that this high profile cause is not one they want to be associated with. So, we have Anon rattling on about free speech being violated, and want to restrict the free speech of others to correct this supposed 'wrong'. Of course, it's not the first time they've shown their lack of understanding; previously they attacked the US copyright office, just months after it made big provisions in DRM circumvention. I write this as I've been sitting in Anon's IRC channel for several hours, and it's clear who and what anon really is. Anon are those who want to help, but don't know how; those that want to do something but are jaded by the system; and those who just want to lash out at someone that doesn't agree with them – a couch-potato version of a black-bloc protester. It's the later that dominate things there. was one comment I witnessed, and it shows the mentality of at least some. “Athenian democracy” is a term I would debate. If anything, the better analogy is 'Hive Mind', where like the Borg, there is one overall aim to which members join, are assimilated and pursue. Instead of assimilation however, it's damage, Hoodie-Borg? There's also some other interesting aspects about this. The media mainly calls them 'hackers' but let's be fair to them, they are not. Hackers tend to mean people who insinuate themselves onto a computer system to access data, and that's not what Anon are doing. 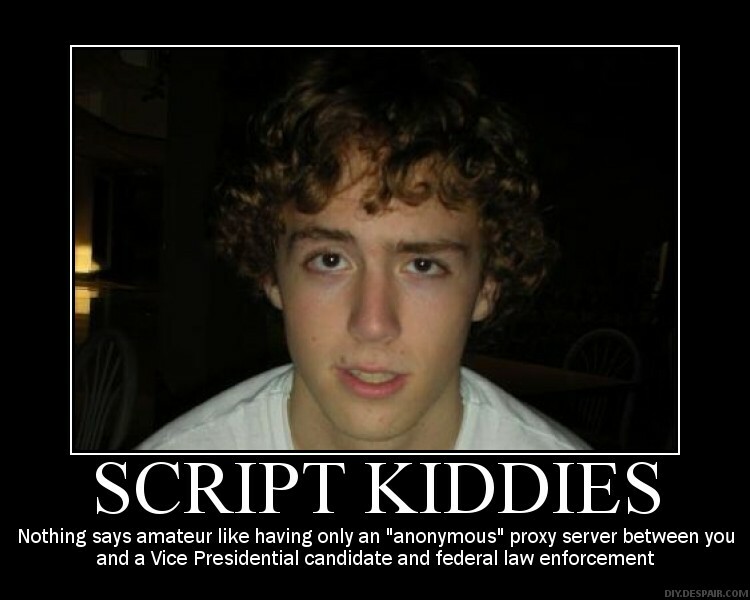 Anon is using a script, to perform a simple action with little overall thought or skill needed to perform the action. 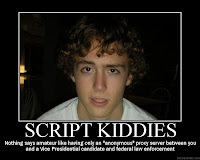 There is a name that describes that, and it is SCRIPTKIDDY – a term which is considered derogatory. It's also, unfortunately for Anon, 100% accurate. Of course, there's the other point to be made - Anon doesn't REALLY care about things. People who care about things, really passionately believe in things, are not afraid to stand behind those beliefs. When you think you're in the right, and acting that way, you don't hide that you're doing it. If you feel the need to protest, but have to hide who you are, you clearly know what you're doing is either wrong, or not supported by the majority of people. In short ,you're AFRAID to publicly associate yourself with it. They don't have the convictions to stand behind their lofty statements (probably because when it comes out that most are too young to vote ,it loses most of it's impact). It's the same reason the KKK dressed up and hid – fear of having to pay the consequences of their actions, and there will be consequences. So, we've got a 'protest' where almost all those involved aren't supportive enough to stand up for their actions, have no real clue of the issues or law involved, and are just looking to lash out. Operation:Payback isn't a very good name for that, which is why they've started calling it Operation:Avenge Assange. Yet there is a more appropriate name for their activities, as I pointed out on twitter last night, that fits their actions to a tee. It's both descriptive, and accurate, and what more can you ask for, when you're supposedly protesting in support of a group that promotes truth and honesty? 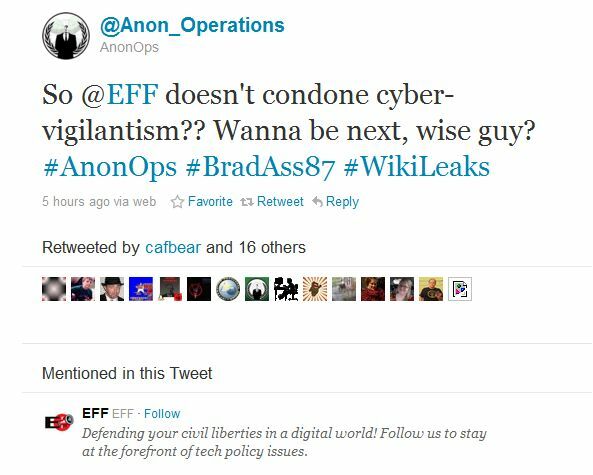 Of course, we'll just have to wait a few years, for wikileaks (or one of the many other whistleblower sites) to acquire the information on just how many agent provocateurs there are in Anon, and how many were AnonOps. My guess is 'a lot'. Just to show how it's not about a 'cause', but about an attitude and causing issues, there's a lovely response to the EFF. 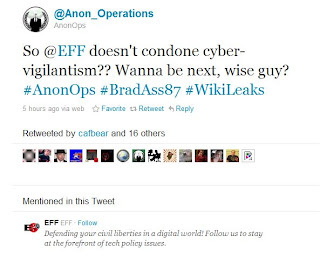 When the EFF said (as all us responsible people who deal with facts and grown ups have) that their actions are not something they can support, anon threatened the EFF.